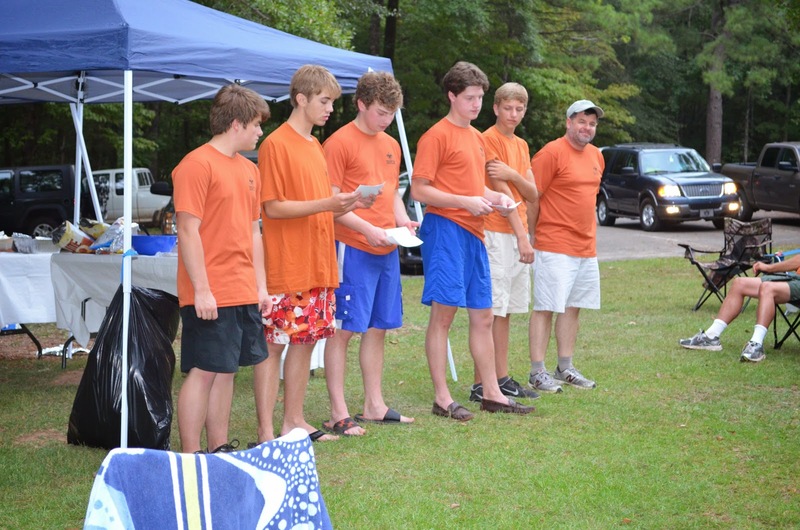 On Sunday, Aug. 24, Troop 50 continued the tradition of gathering Scouts, leaders, and families together for its annual summer kick-off-the-Scouting-year court of honor and family picnic at Chewacla State Park. And, of course, no troop event would be complete with some great food! From bratwurst and hot dogs grilled by Assistant Scoutmaster Jason Smith to a full spread coordinated by troop committee member Jill Perry and prepared by the troop's families, there was something for practically any taste bud! 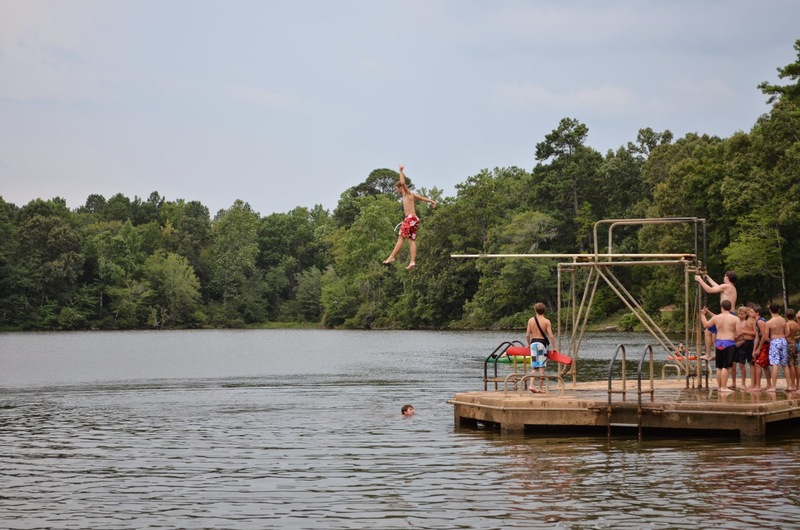 While many Scouts and a few adults took to the lake's floating dock and high-dive, others were content with the chance to catch up after busy summers and to get acquainted better with others in our growing troop family. Once the dinner bell rang and everyone's stomachs were full, Scoutmaster Andrew Baird, assisted by Senior Patrol Leader Will and Assistant Senior Patrol Leader Davis, convened the court of honor. Troop 50's newest Tenderfoot Scouts! 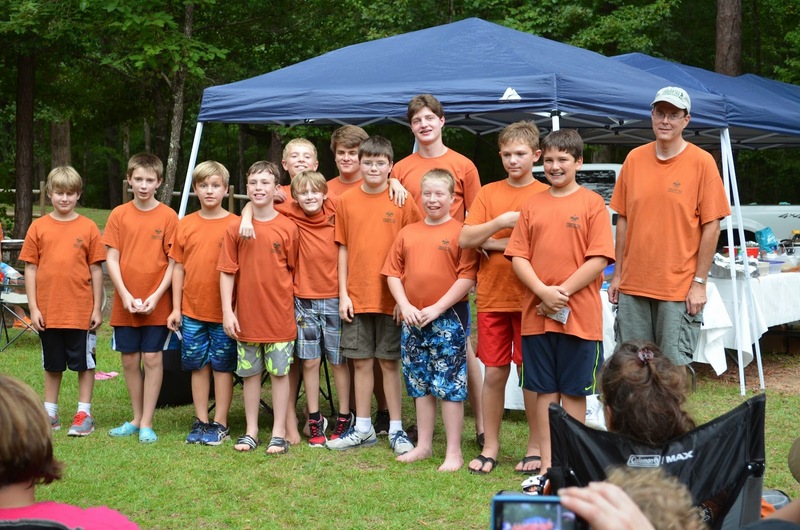 The awards presented included a bevy of merit badges earned by Scouts attending summer camp, as well as the Tenderfoot rank presented to our newest Scouts who participated in Camp Woodruff's "Mountain Man" first-year camper program. Scouts weren't the only ones who won awards — the troop itself won ribbons for participation in programs while at Camp Woodruff. Troop 50 OA members (center, left to right) Robert, Kyle and Davis. Finally, Order of the Arrow members in the troop — Robert, Kyle, and Davis — conducted an OA callout ceremony to identify those Scouts who were elected during the troop's elections at its June court of honor. The troop elected Senior Patrol Leader William and Turn Up Patrol Leader John for Order of the Arrow membership, and the troop's adult leadership selected Assistant Scoutmaster J.P. Pendleton for membership as well. Each will be eligible to attend the Chattahoochee Lodge's membership induction weekend, also known as an Ordeal, within the next 12 months. To cap off the event, Scoutmaster Baird accepted the ALS "ice-bucket challenge" issued by Troop 50 parent John Jerome, who has been battling ALS himself for a number of years. While there was a lack of those willing to join him for the ice bath, there didn't seem to be a shortage of Scouts willing to dump the ice bucket on their scoutmaster! For more photos from our court of honor, visit the troop's online photo album.